2 Corinthians 1:9, “Yes, we had the sentence of death in ourselves, that we should not trust in ourselves but in God who raises the dead, 10 who delivered us from so great a death, and does deliver us; in whom we trust that He will still deliver us, 11 you also helping together in prayer for us, that thanks may be given by many persons on our behalf for the gift granted to us through many” (New King James translation). The "deliver" verb here is rhyomai in Greek, which means to rescue, deliver, save, etc. (It is a different word, but would be essentially a synonym of the word for save – sozo -- as when we hear that Christ came to save the world in John 12:47.) We see that God delivered, does deliver, and will deliver us, which is the standard Orthodox understanding of when salvation happens: with Christ on the Cross, during our lives, and ultimately on the Last Day. “For I know that this will turn out for my deliverance through your prayer and the supply of the Spirit of Jesus Christ” (New King James translation). In this case, the Greek word for deliverance is soteria, which means salvation, rescue, deliver, etc. It is the standard word used for salvation, such as in Romans 1:16 St. Paul says that the Gospel of Christ, “is the power of God to salvation for everyone who believes. In both Epistles the Apostle is saying that He is saved not by God alone, but by God with the co-helping prayers of the Saints. The Lord is the One Savior, but His faithful ones enter into His work of salvation, "As the Father has sent Me, I also send you" (John 20:21). As Christ Jesus is our High Priest according to the order of Melchizedek, we are enrolled in His priestly service (1 Peter 2:9). As Jesus is the light of the world, we are to spread His light illuminating those whom we influence (Matthew 5:14-16). As Christ is the Only-begotten Son of God, we are adopted as children of God (Romans 8:15). Et cetera for all that we do, and all we are, as Christians. It all starts with Christ who does the work but who also gives meaning and fruition to all that the Church does (Ephesians 2:10 and Hebrews 13:20-21; vis-a-vis John 14:10). 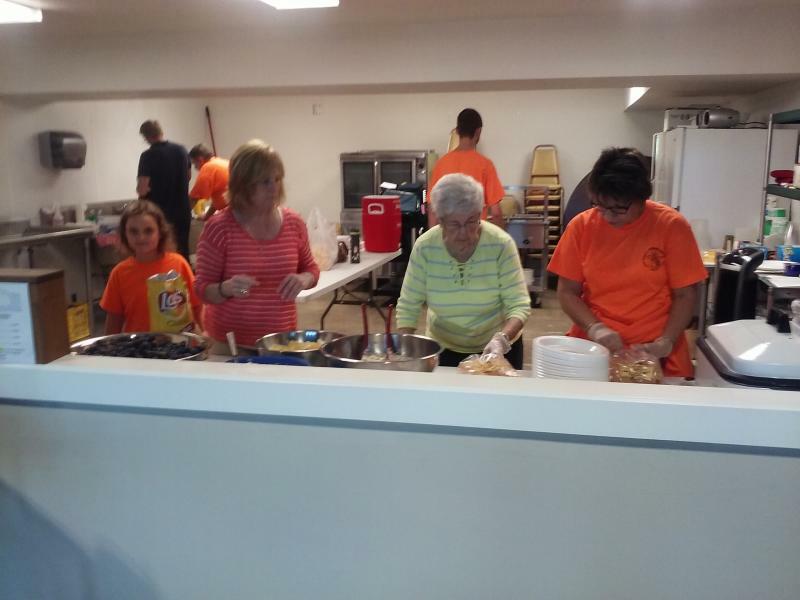 A few weeks ago, our community had the opportunity to help out at The Well, a charitable effort of most if not all churches in Pella helping people of struggling with shortages of money, employment, transportation, housing, friends. We brought food, and served dinner after singing the “Our Father” with Fr. Bartholomew doing the blessing. The Well staff was thoroughly impressed with the singing of the Lord's Prayer, and that we chose to pray before the meal. Surprisingly, we were the first group to have done a prayer before the meal. 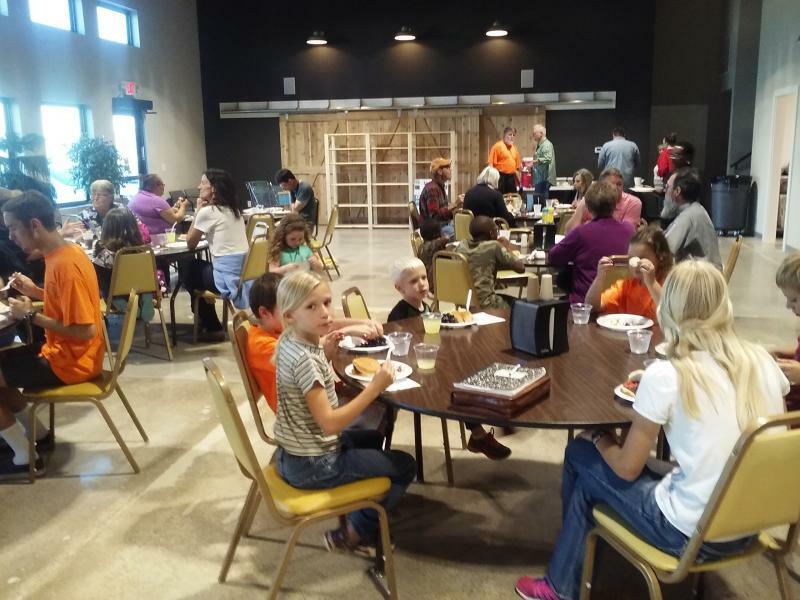 We prayed with and visited with students, and played with children while parents attended The Well's "Getting Ahead" class. In another work of charity, Patty has spearheaded the task for us to collect 200 cans of green beans as our part of a greater effort by Pella Food Shelf donors to provide 200 traditional Thanksgiving meals for locals who cannot afford to buy their own. 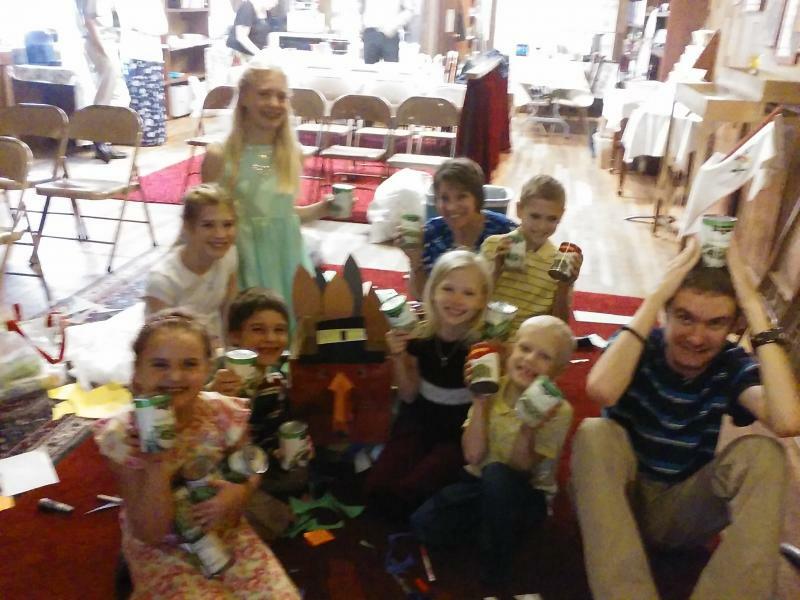 She and our church school kids beautifully decorated a box like a turkey for this Thanksgiving Food Shelf donation. Donations for the year: $25,214. Expenses for the year: $31,908. Your prayers and support are appreciated!